MEPs urged EU heads of state and governments meeting in Brussels this week to agree on an EU budget for 2014-2020 to strike a deal that delivers enough money to meet promises, but also enough flexibility to cope with the unexpected. The long-term budget cannot be fixed without Parliament's approval. Several MEPs criticised member state governments for trying to cut the Commission's EU budget proposal with no regard to the consequences. "All cuts are really to the detriment to innovation, sustainable development, more research, and unemployed youth. That's where the cuts hit. Is this responsible? Can you justify it?" asked Rebecca Harms (DE) for the Green group. The long-term budget (also known as the financial perspective or the Multiannual Financial Framework, MFF) sets limits on EU spending, per year and per heading, for the budget period as a whole. When Parliament and member states agree annual EU budgets they must respect these MFF limits. Many MEPs urged that the economic crisis must not prevent the EU from adopting more ambitious budgets once it is over. "We shall never accept an austerity budget for seven years. If we do this, we accept that the crisis will go on in infinitum. We are not that pessimistic", said EPP group leader Joseph Daul (FR). Several MEPs called for more flexibility to transfer money between years or headings as required and for a mid-term review of the MFF. "I propose a 'sunset clause' that requires us to give a fresh consent, after three years, to go further with this budget for the next four years." said Liberal group leader Guy Verhofstadt (BE). Several MEPs also worried about proposals to create a substantial gap between budget commitments (EU legal promises) and payments (cash to pay the bills resulting from the promises). Parliament's President Martin Schulz said he would not sign any budget decision that leads to a deficit. "I won't do it. Even if Parliament tells me I won't, because it is an illegal decision. The treaties commit us to balancing the budget". MEPs also urged member states to halt competition among their finance ministers for special exceptions and the highest possible rebates. Funding the EU budget from new "own resources", rather than from direct contributions from national budgets, could end this competition, they noted. "We need own resources because this shameful game of pitting country against country, rebate against rebate, must stop", said Hannes Swoboda (AT) for the S&D group. 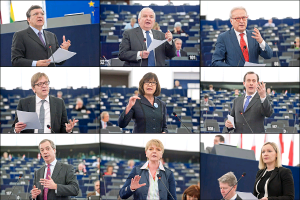 Some MEPs argued that a smaller but reformed budget could work better than the current one. "We must stop thinking that only a bigger budget will solve the many problems in Europe. Instead we need a better budget", said Martin Callanan (UK) for the ECR group. He added that scrapping the member states' rule that forces Parliament to meet twelve times a year in Strasbourg would be a good start. "I know that the costs for maintaining this building are a drop in the ocean, but it would do us an enormous amount of credit if we could shake off this expensive relic from the past", he said. "It is not the case that an agreement in the European Council will become a fait accompli. Then come the intensive negotiations with the Parliament. The summit is the beginning, not the end, of the process", concluded Ms Creighton. She added that the demands for flexibility, a mid-term review and own resources had been heard and would be considered.